When connoisseurs of soul music hear the names Dan Penn, Spooner Oldham, David Hood, Jimmie Johnson, Reggie Young, Wayne Jackson and Carson Whitsett, they perk up, because those names are all over the credits of some of their most treasured records. It isn’t every day that these legends of Memphis and Muscle Shoals lore come together, but the entire magnificent seven eagerly converged on Penn’s Dandy Studio in Nashville recently when they heard the news: Bobby Purify had returned. 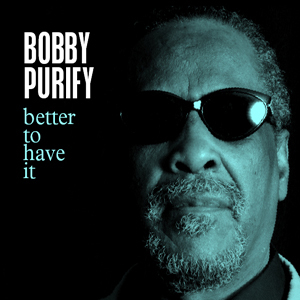 Of the great soul singers from R&B’s golden age in the 1960s and ’70s, Purify is perhaps the most underappreciated. Although he’s the contemporary — and equal — of such southern soul legends as Wilson Pickett, Percy Sledge and Solomon Burke, his stature has been obscured by a twisted career path and some basic confusion. The singer/guitarist’s real name is Ben Moore, and he worked with and behind the likes of Otis, James Carr, James Brown and the Tams before becoming half of Ben & Spence, who cut a number of sides for Atlantic in the ’60s before hooking up with James Purify in 1971. Adding to the confusion is the fact that Moore was the third individual to take the name Bobby Purify, although he’s answered to that moniker for close to 35 years. These and other circumstances conspired to deny him the fame he deserved, and he’s had some hard times, especially in recent years—but one thing that couldn’t be taken away from Bobby Purify was his gift. And that makes his unexpected and triumphant return a joyous event for all of those who care about rhythm & blues in the original, uncorrupted sense. That somebody was Lindsey’s writing partner, Dan Penn. Since co-writing the title song for Solomon Burke’s critically lauded 2002 comeback album, Don’t Give Up on Me, with Whitsett and Lindsey, the legendary writer/producer had been wanting to cut an album of pure soul, and the three longtime collaborators had continued writing with that idea in mind. There was just one problem — a dearth of pure soul singers. Meanwhile, the breakup of Ben & Spence coincided with Robert Lee Dickey’s departure from James & Bobby Purify, prompting Papa don Schroeder, who managed both duos, to team Moore with James Purify and take the name Bobby Purify. The revamped duo scored a U.K. hit in 1975 with a version of the original duo’s U.S. hit, Penn and Oldham’s “I’m Your Puppet.” and had some good years together before James, beset by legal difficulties, disappeared from the scene. Moore retained the name Bobby Purify for his R&B work, while having a second career as the gospel singer Ben Moore, receiving a Grammy nomination for the 1982 LP He Believes in Me. In 1994, he began suffering from glaucoma but continued working under both names for as long as his diminishing vision allowed. Then the blindness, the depression, the intervention and the second chance. After the hugs and another round of “I thought you was dead,” the veterans got down to business. Says Penn: “The first thing I told Bobby was, ‘Let’s try to go from like ’64 or ’65 to Al Green, and let’s don’t do anything else—just straight-ahead R&B.’” Because of Purify’s burnished, pitch-perfect tenor—which was sounding stronger than ever—and the songs they’d come up with, Penn felt strongly he could achieve his goal, but he also knew he couldn’t just roll tape and expect to get results. Making all those great records at Fame and American had required concentration and energy, and this one would be no different. Better to Have It vividly recaptures the entire expanse of first-generation Southern soul, from the silky balladry of “Forever Changed” to the swampy vibes of “The Pond”. Among the most powerful moments is the ballad “Nobody’s Home,” which moves from social commentary to a sort of down-home metaphysics during its three-and-half minutes. The pathos of the lyric clearly affected Purify, who gives a performance of stunning conviction. “It hit me like an old Drifters tune,” says Penn, “but when Bobby did it, he took it somewhere else.” Another stunner is the closing “Only in America,” a patriotic song that, like Brother Ray’s indelible performance of “ America the Beautiful” near the end of his life, renders Red State/Blue State partisanship moot. So, too, is Dan Penn. The producer nailed that old-time soul LP he’d envisioned, but Better to Have It turned out to be much more than a formal exercise. “To tell you the truth, other than the initial thought of a soul record, I never thought any more about it,” says Penn, “I was just cuttin’ Bobby Purify, and he had this really good, hungry voice. After we got started, I didn’t think Muscle Shoals, Memphis, New Orleans or nothin’ — we just cut this guy. We got good songs and we put it together pretty decent, but really, what you got is, you got a guy with a whole lotta heart that you don’t mind listenin’ to for a long time.